Recently we started to get reports of untrusted certificates for AnyConnect and when accessing the ASDM web page. When you browse to the web site it was presenting the default “ASA Temporary Self Signed Certificate” rather than our public SSL certificate. As soon as I added the command into our ASA it started working again. It sounds like this should be a default entry going forward for all ASA firewalls. Want to learn more about elliptic curve cryptography or look at this for a primer. I’m trying to setup the Microsoft Intune MDM solution with the Conditional Access policies to our Exchange On-Premise server. The idea behind this is that users must enroll their device with Intune via the Company Portal app on their mobile device and then once they meet the requirements, they will be granted access to Exchange ActiveSync. To access your organization’s email, you must enroll your device and make sure that it complies with your organization’s security policies. Follow the steps below for the relevant device. But after upgrading the latest version of the Microsoft Intune On-Premises Connect for On-Premises Exchange, I’m no longer receiving these emails but other users are. And the TraceId above has nothing to do with the obfuscated TraceId above. I have opened a case with Microsoft Online Support about this and will update once I get more information. %ASA-6-725001: Starting SSL handshake with client outside:X.X.X.X/64508 for TLSv1 session. %ASA-7-725010: Device supports the following 6 cipher(s). %ASA-7-725008: SSL client outside:X.X.X.X/64508 proposes the following 8 cipher(s). If you use Java 7 Update 51, you must upgrade ASDM to Version 7.1(5.100) or later, and you can only use the Java web start. The ASDM Launcher is not supported. So the alternatives are to downgrade your Java on your workstation or upgrade to the latest ASDM version at this point to get the ASDM working again. While the United States celebrates Thanksgiving today (I do miss my brother’s Buffalo Fried Turkey) I picked up a couple bags of Pork Scratchings from the Saint Nicholas Fayre going on in York. 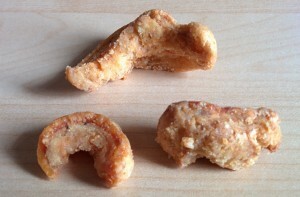 What are pork scratchings? They are the UK equivalent of pork rinds in the US. But while most of the pork rind products I’ve had in the US have been the equivalent of pork flavored puffs, the pork rinds from this particular vendor are MUCH better. First, they are sold in paper bags. The scratchings quickly soak through the bag turning it slightly translucent. All fatty products should be sold this way, as putting them into plastic or mylar defeats the purpose. Next a bite. Hard and crunchy on the outside (some of the big ones can be almost teeth damaging), but rich and fatty on the inside. The salty flavor isn’t over powering and almost has a slight season salt taste as well, just makes this pork scratching perfection. Thankfully, for my health at least, the vendor is only in York on special market days, but it is the new tradition to pick up a bag (or three) when they are in town. So while we aren’t celebrating Thanksgiving today in the UK I’m trying to keep up the tradition of over indulgence. Happy Thanksgiving everyone! I recently upgraded a couple of Cisco 3850 switches and noticed that the TFTP transfer rate to get the Cisco IOS files to the switch were horrible (approximately 200Kbps) which took a LONG time to transfer the 250MB file required for these switches. 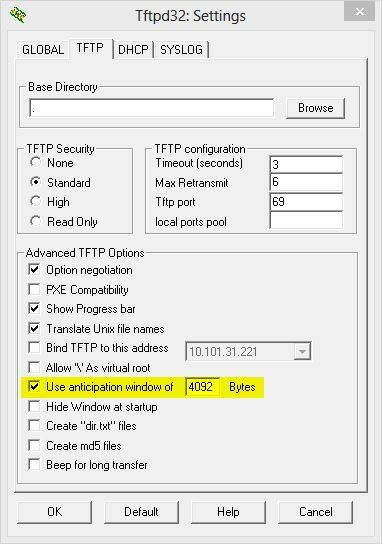 After trying a couple different TFTP clients, and finding nothing that worked, I dug into the settings on my preferred TFTPD32 software and found that changing the TFTP setting for “Use anticipation window of” to 4092 gave me about a 4x to 5x improvement in transfer speed. Still slower than I would have liked but definitely tolerable now. If you have just signed up for a newer GoDaddy hosting account (using either cPanel (Linux) or Plesk (Windows)) for a domain that hosts email externally from GoDaddy account you may have problems sending email. I noticed this problem when trying to send email to new WordPress users (installed via GoDaddy) that I just created and they never got the introductory email from the server. 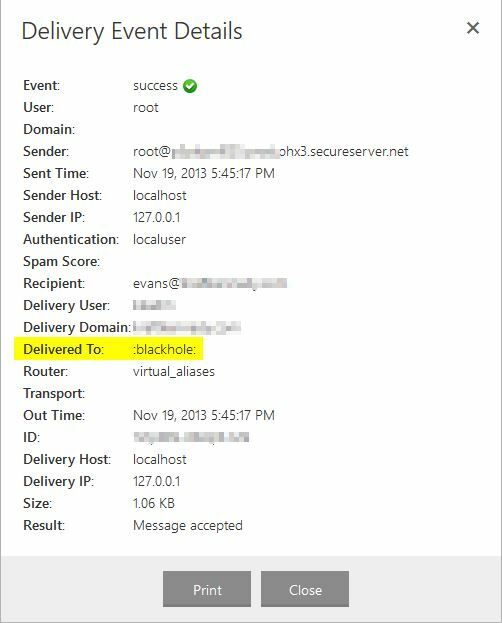 But click on the magnifying glass and the Delivery Event Details will show that this message is delivered to the :blackhole: address. After an almost two hour phone call with GoDaddy support, their support person was able to contact a back end engineer who “changed something” on our account so that GoDaddy was no longer authoritative for email for our hosting domain and mail correctly started to flow out to the Internet. I wasn’t able to get GoDaddy Support to clarify exactly what was changed on the back end but it is apparently a new “feature” of the newer hosting platform that hasn’t been reported previously. There is currently no way to change this through the existing cPanel interface. So please give your GoDaddy Support a call if you are running into this problem and push for them to escalate to the back end support as soon as possible. As I’m continuing my British education (and hopefully yours too) after my previous posting about Rag & Bone Men, I only just found out about the musical group Boney M., a huge disco hit from the 1970’s and onwards, but apparently not a big hit in the United States. Go ahead and click play below on the Rasputin song and read on….. I originally heard a song from them while listening to BBC York during my workday. When my wife came home that evening I asked if she had ever heard of Boney M. and couldn’t believe I had never heard of them. Even my mother-in-law knew the name and remembered the band and music. I spent most of the day listening to the various Boney M offerings on YouTube, so catch up on your 1970’s Euro disco music and get educated. When I asked our neighbour what he was yelling, he didn’t know either. 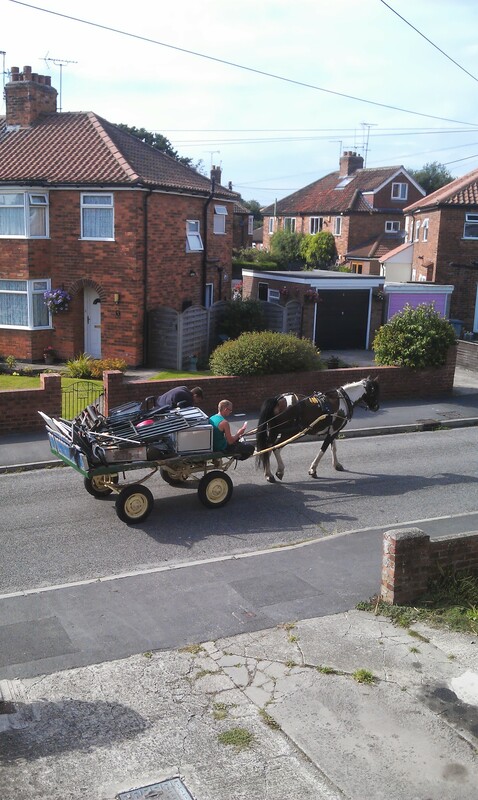 Turns out that these are Rag-and-Bone men, the scrap collectors of the UK, that drive by to pick up old unwanted items that they can sell for scrap. Typically they are more interested in metal as it has a higher resale value, but will pretty much take anything. We are in the middle of a migration from Lync 2010 to Lync 2013. The migration has been very smooth and we moved several users over to the Lync 2013 environment for pilot. Shortly after migrating the users, we identified issues with our Dial-In Conferencing. Anyone on Lync 2013 that created a conference could not dial into the conference. Users would call in, be prompted to input the meeting number and then would receive a busy signal. If the user moved back to the Lync 2010 pool, Dial-In Conferencing would work again. 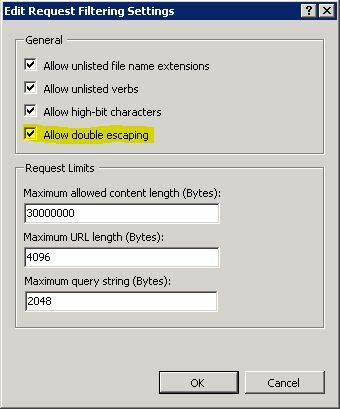 So the default setting in Lync 2013 turns REFER method support back on and sets it to “Enable sending refer to the gateway”. Just set the Lync 2013 REFER method support to “None” and save the settings to match the Lync 2010 environment. Once the change was made, the Dial-In Conferencing started working again for our Lync 2013 users and the migration could continue. I recently deployed Microsoft System Center Configuration Manager (SCCM) 2007 R3 for a client on a newly built Windows Server 2008 R2 with SP1. Everything worked well and I was able to image and deploy applications to the workstations without an issue until trying to deploy an older version of Elite Enterprise. The installation would start, but stay at 0% complete for hours and never actually download. There were no error messages on the client workstation indicating there was a problem. I had already updated the c:\windows\system32\inetsrv\config\applicationHost.config file to remove references to excluded file extensions under the section which has been mentioned elsewhere as causing problems during a BITS transfer. 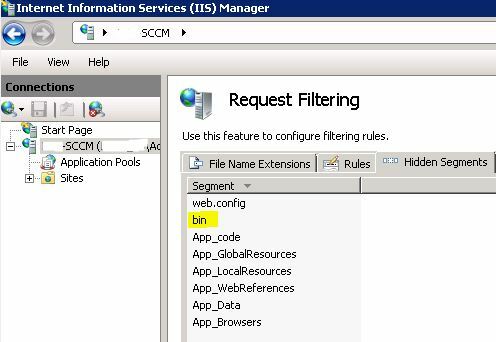 In digging into the IIS logs further showed some files getting stuck with a 404.8 (Hidden Namespace) error message, again a known issue that has been fixed in the applicationHost.config file by modifying the section of the file. In this case there was a /bin/ directory that was included in the Elite Enterprise installation that was getting stuck. I also saw the occasional 404.11 (URL Double Escaped) error message in the log that again has been covered elsewhere and fixed in the applicationHost.config file by modifying the section of the log. Once these changes were made via the GUI I was able to go back to the workstation and quickly deploy the stuck application. So sometimes, when it doubt, go back to the GUI. Note: This article also posted to my work blog here.